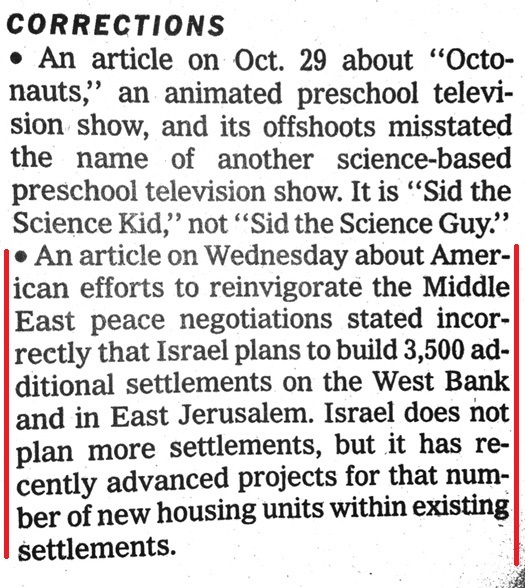 In the first media correction prompted by CAMERA’s Israel office since the opening this week of its Jerusalem hub, the International New York Times corrects an article which had incorrectly reported that Israel advances plans for 3,500 new settlements. An absence of progress on the core issues, an ill-timed Israeli plan to build 3,500 more settlements on the West Bank and East Jerusalem. . . . CAMERA commends the International New York Times for the prompt correction which demonstrates the global reach of our Jerusalem hub. See here for additional New York Times corrections prompted by CAMERA.